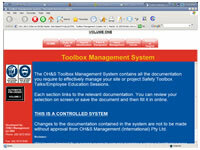 The Toolbox Management System is an excellent tool for company Supervisors, Managers and Project Managers to conduct effective Safety Training / Education sessions with all employees. Formal, comprehensive presentations have been designed in Power Point style presentation for ease of understanding. The system ensures that relevant safety information is passed on to the employees to increase the level of safety awareness and understanding in the workplace. In addition to the training packages, the user can print out copies of the master documentation. Having such a wide range of topics to choose from at the click of a button, makes the system very productive and effective tool for a wide range of organisations.